As we were driving back onto St. Joseph’s Indian School’s campus from Denver Monday afternoon, we saw a girl in pajamas going into the Benedictine Homes. Laura remarked that she must have spent the day at the health care center. Then we saw the rest of the procession from school … also wearing pajamas! It was the kick off to Red Ribbon Week – our annual celebration with the message that drugs get in the way of dreams and success, and there are so many fun and healthy alternatives. Monday the students were encouraged to wear pajamas to school – follow your dreams . . . don’t do drugs. Tuesday, bright red ribbons tied around many trees on campus got everyone’s attention. On Wednesday, the entire school had matching shirts, with the inspiring Gandhi quote, “Be the Change You Wish to See in the World.” In the evening the homes gathered for Red Ribbon Relays. The potato sack races were run (or hopped) with plastic garbage bags around Wisdom Circle. The problem with those was that scraping against the pavement started to wear holes in the bags, and by the last leg the kids could put their legs through the holes and run! 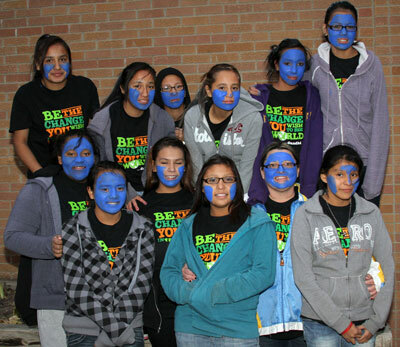 Playing on the theme of “I will say no to drugs until I’m blue in the face” kids painted their faces blue – some completely like Blue Man Group, others with mustaches or creative artwork, but each unique. This week staff reading group discussed a book of poetry called “Walking the Earth, Touching the Sky.” The collection was published by the students at Red Cloud Indian School. Everyone appreciated the beautiful artwork, the cultural information, and found several lines to be profound and thought provoking. Robyn, one of our Family Service Counselors, shared that with her book on her office end table, students would frequently pick it up and start leafing through it themselves. They were impressed by how peers articulated in words what they too felt. That led them to open up and talk more about their experiences of grief, hurt, and being misunderstood, so that was an immediate benefit of discussing the book. Besides the difficult times some poetry expressed the beauty of nature around us, and the strength of God and spirituality. Volleyball season wrapped up for the year with a fun match Tuesday night between the eighth grade girls and our staff. The adults got to be kids again, with wild costumes and Halloween makeup. I noticed that whenever our staff started pulling too far ahead, their serve suspiciously failed them and control of the ball went back to the students. We laughed at the trick shots and fun antics to give the kids more chances, but after two overtime games with many ties and rallies the staff prevailed. I was showing a visitor from Germany around St. Joseph’s Indian School’s campus. When she heard how far away our visitor had come from, one of our first graders asked, “Have you ever been to White Lake?” (a small town of about 400 a few miles from Chamberlain). Our visitor remarked that there is such a contradiction between how so many of the children seem normal and well adjusted, yet realizing that it is often sad circumstance that brought them here. The younger students talk more freely about life’s difficulties than our older ones, but we encourage all to work through life’s hardships. I stopped at the museum to wish Vickie a happy birthday. Perhaps a third of our museum has been put into storage preparing for the next phase of work, and the space looks so empty. But in a few months we’ll be having some great new updates. We are still open and have a good number of visitors from hunters in the area for pheasant season. Bursting through the linked arms of a second and third grader wasn’t too difficult for me, but I was gentle about it. The students got a laugh out of it when I joined them in Wisdom Circle for a couple of rounds of the children’s game after school today. Today began our second quarter – hard to believe we’re already that far along with our school year! Our custom is to start each quarter by gathering in Our Lady of the Sioux Chapel for an all-school prayer service. This Sunday Kateri Tekakwitha, a Mohawk/Algonquin woman who lived during the 1600’s is being canonized a saint. Fr. Anthony quizzed the students about her life. Since she serves as a good role model for our Native American students, they’ve heard her story and came up with answers to all of the questions. The pastoral care team put together a slide show set to a meditation on the scriptural theme of being lifted up on Eagle’s Wings and allowing our spirits to soar. Interspersed with inspiring pictures of eagles majestically in flight were pictures of our students going about their everyday routine of living and learning here on St. Joseph’s Indian School’s campus. As students recognized themselves we heard giggles, but also great focus, attention and pride. Afterwards we announced the Fr. Leo John Dehon SCJ Circle of Courage awards for the quarter, given to students who are good role models to others, and show generosity and kindness in school and in the homes. Hopefully the message that they can fly and God will raise them up was internalized. Along that theme, I had an email from a donor – a veteran – who had been through many ordeals. His message to me was to help our students overcome the obstacles in their lives. It was a gorgeous 80 degree day. Matthias Home (6th– 8th grade girls) invited me to supper. They fired up the grill and ate their evening meal on picnic tables outside the home. We accept students throughout the school year as openings occur, and I got to welcome Brianna, our newest eighth grader. Her housemates were doing their best to make her feel welcome and help her fit in. Since our students live on campus, we have school on many of the federal holidays, but Labor Day is the last gasp of summer, and it was a day for fun and relaxing. All the Native American students on campus were invited to walk downtown for a matinee movie. Temperatures hovered around 95 degrees and we worked up a sweat. Everyone was glad to come into the air-conditioned theater and have a pop and bag of popcorn waiting for them. The movie itself was rather silly, but I enjoyed watching the kids laugh and enjoy themselves. “You’re too nice to everyone. If you want to be a real boss you have to yell more and get things done,” she explained. While students have a lot of wisdom and insight, I guess we’ll just have to agree to disagree on my management style. We ended the day with a cookout in Wisdom Circle, and had a chance to shoot baskets, toss around a football and slap away at the tetherball. As I walked through Wisdom Circle on my way to the Rec Center, I noticed one of our first grade girls sitting alone on a bench away from the other kids. I said, “You look sad – is anything wrong?” She had been playing tether ball, but when her time was up another girl came and played with her friend and she was feeling left out and probably jealous. While those are small things to us adults (hopefully we handle them OK) it was a big deal to her, and putting a damper on her whole day. Then another tether ball pole was freed up and she was off to play, things right in her world. Our girls had 4th, 5th and 6th grade basketball games against Chamberlain. There were plenty of St. Joseph’s staff with children on the Chamberlain team. Practically everyone in the stands had divided loyalties, so there was lots of cheering for everyone. What the girls lacked in talent, they made up for in hustle and enthusiasm. It was particularly fun seeing the 4th graders go at it. The boys had a great time prepairing for their was inipi - sweat lodge ceremony. This afternoon was inipi – sweat lodge ceremony – for our teenage boys who wanted to participate. 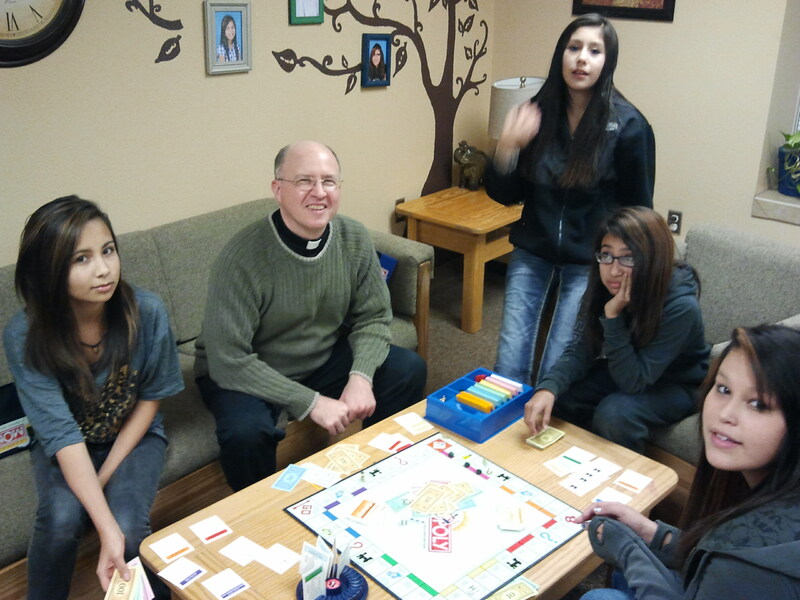 Several high school students served as mentors for 8th graders, a few who were going into the lodge for the first time. The grandfather of one of our students led the ceremony. I stopped by beforehand to see how the fire to heat the rocks was coming along. Mark, who works in the rec center, was the firekeeper. As the rocks heated up, one started to crackle and pop, which is dangerous in the small confined spaces. Since Mark has lots of experience, he culled that rock out with his pitchfork, and selected another that would be better. After the four rounds of prayer, everyone gathered for a traditional meal at Speyer Home.